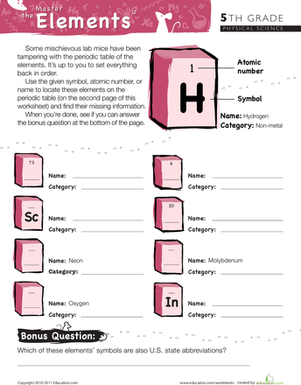 Looking for a new way to study the elements on the periodic table? Look no further, it's Concentratium! After simply cutting the cards out, you'll have a fun game that combines elements with a classic concentration game. Flip over two cards at a time, trying to match each element with its symbol from the periodic table. Want to add a few superheavy elements into the memory game mix? Follow this link to see Un-believable elements. 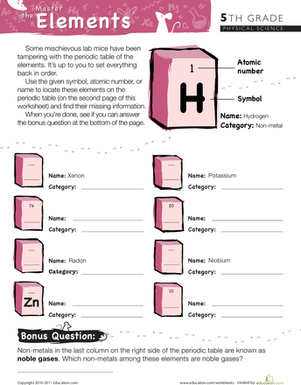 Test your knowledge of the periodic table of the elements with this quiz page! 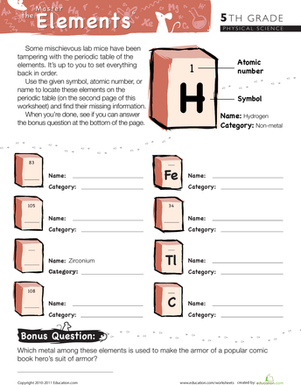 Arm your budding physicist with a free print-out version of the periodic table of the elements! The periodic table of the elements is full of helpful information. Figure out how to read the periodic table with this helpful guide. Test your students' knowledge and memory of periodic table elements with this crossword puzzle. Can your fifth grader recover the missing information about these elements from the periodic table? Your fifth grader is the only hope for finding the missing information from these elements of the periodic table. Give your child a painless beginner's introduction to the periodic table of elements with this fun worksheet. 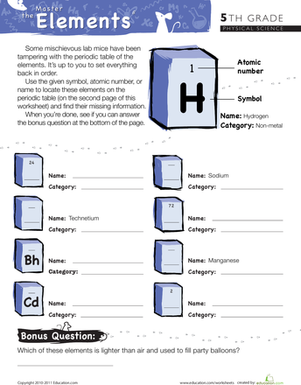 --worksheet gets your fifth grader practising with the information in the periodic table of elements.